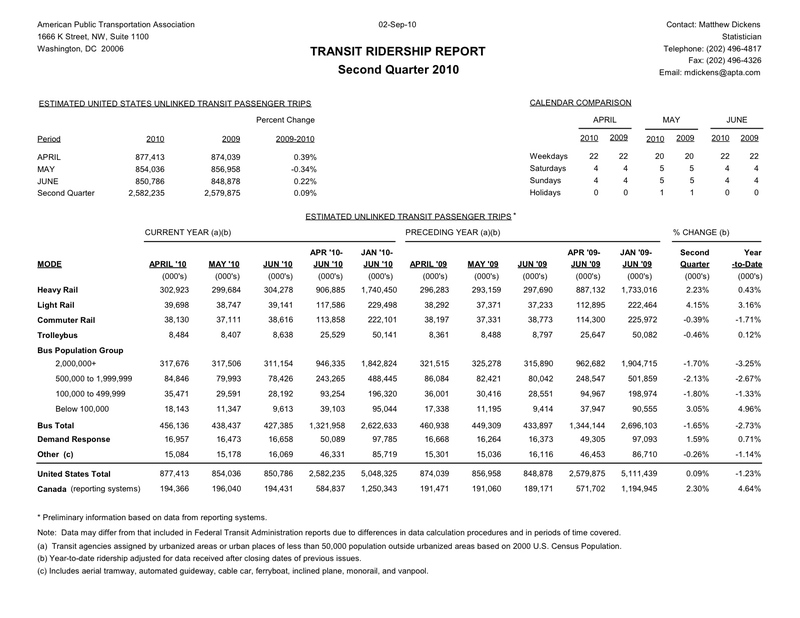 Page 1 of APTA's quarterly ridership report. Click above for larger image. In the second quarter of 2010, more than 2.5 billion trips were taken on U.S. public transportation as ridership increased slightly by 0.1 percent over the second quarter of 2009, according to a report released today by the American Public Transportation Association (APTA). This uptick in ridership is the first increase in six quarters. Previous to this quarter’s ridership increase, public transit use had declined in the past five quarters due to high unemployment, the economic recession, and lower state and local revenue for public transportation. Sixteen out of 28 light rail systems reported an increase in ridership for the second quarter of 2010 as light rail ridership increased nationally by 4.2 percent in the second quarter of 2010. Light rail systems in five cities saw double-digit increases in the second quarter: New Orleans, LA (27.8%); Phoenix, AZ (12.7%); Seattle, WA – King County Metro Transit (12.5%); and Portland, OR (11.3%). The remaining light rail systems showing increases were located in the following areas: Philadelphia, PA (9.9%); Minneapolis, MN (8.3%); Charlotte, NC (6.8%); San Diego, CA (6.5%); Tampa, FL (6.3%); Los Angeles, CA (5.7%); Boston, MA (4.8%); Oceanside, CA (2.5%); Salt Lake City, UT (2.0%), and State of New Jersey (1.4%). Seattle’s Sound Transit system had a more than 100% increase in ridership due to a new line that began in July 2009. Eleven out of 15 heavy rail systems (subways and elevated trains) experienced ridership increases from April through June of 2010 over the same period in 2009. Nationally, heavy rail ridership increased by 2.2 percent. The heavy rail systems with the highest percentage increases in ridership in the second quarter of 2010 were in the following cities: New York, NY – MTA Staten Island Railway (9.1%); Baltimore, MD (7.2%); Philadelphia, PA (6.3%); and Chicago, IL (5.4%). Ridership increases were also experienced in the following cities: Jersey City, NJ (2.9%); New York, NY – MTA New York City Transit (2.4%); San Juan, PR (1.5%); Los Angeles, CA (1.4%); Washington, DC (1.2%); and Boston, MA (1.0%). Thirteen out of 27 commuter rail systems reported ridership increases. Cities with commuter rail increases were: Nashville, TN (19.0%); Portland, OR (10.4%); Harrisburg, PA (9.5%); Salt Lake City, UT (9.3%); Alexandria, VA (9%); Portland, ME (8.7%); Baltimore, MD (4.2%); Philadelphia, PA (3.8%); Oakland, CA (2.5%); New York, NY – MTA Metro North Railroad (1.8%); State of New Jersey (1.7%); Seattle, WA – Sound Transit (1.1%); and New Haven, CT (0.6%). Nationally, commuter rail ridership declined by 0.4 percent in the second quarter of 2010. Bus ridership decreased nationally by 1.7 percent. The top increases among large bus systems for the second quarter of 2010 were reported in Saint Louis, MO (15.0%) and Philadelphia, PA (3.8%). Small bus systems with populations below 100,000 also saw an increase (3.1%). Demand response (paratransit) increased in the second quarter of 2010 by 1.6 percent.